Experience the unique opportunity of seeing cats up close and in person. Cats are considered one of the most magnificent animals, and yet are disappearing today. Through interaction with a Zoo naturalist, you will learn about these endangered predators and what is being done to meet the challenges to their survival. Schedule a 45-minute Educational Assembly which brings a cheetah and several of our other small animal ambassadors to your school. Every effort will be made to insure that students have the opportunity to see the animals up close. However, due to the nature of wild animals, students will not be permitted to touch animals. Groups of all sizes are accommodated. Program must take place indoors, in a venue with enough room for students to be seated at least 15 feet back from the animals. Students will need to remain seated the entire program, in assembly style seating. When is the Cat Encounter available? November – February only, call for availability. Evening programs by special arrangement. How much does it cost to bring the Cat Encounter to your school? First assembly $500, second assembly on the same day, $250. Weekend, non-school or evening programs start at $850. 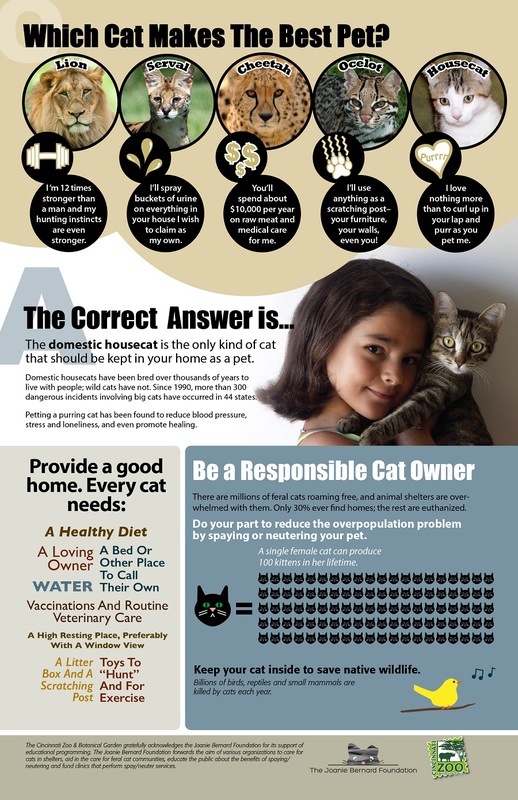 These guides are designed to supplement traveling Cat Ambassador Programs. The Cat Ambassador Program is supported by the Joanie Bernard Foundation. The Zoo partners with the Joanie Bernard Foundation to spread the word about housecat spay and neutering programs available at low cost or no cost. The Kroger Cheetah Encounter this year is SUPER. Look forward to meeting an entire squad of animals and see their amazing abilities. Come help us assemble our team of animal superheroes and see if you too can become a superhero for wildlife! The Cincinnati Zoo is one of the only zoos in the country where you can see a cheetah demonstrate it’s remarkable superpower, it’s super speed! Free with Zoo Admission. When are the Kroger Cheetah Encounters? “Sarah,” the Cincinnati Zoo’s 11-year-old cheetah, sets new world speed record! 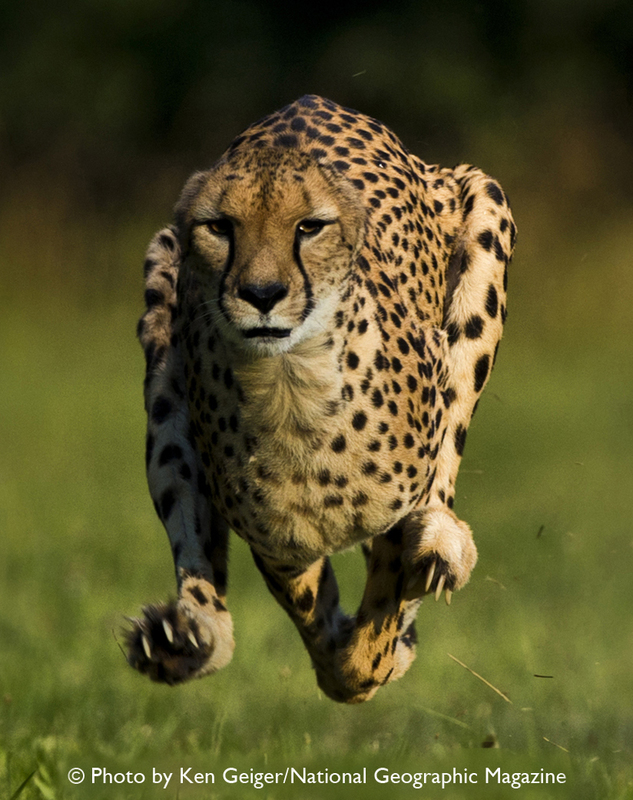 She first earned the title of world’s fastest of all land mammals in 2009 when she covered 100 meters in 6.13 seconds, breaking the previous mark of 6.19 seconds set by a male South African cheetah named Nyana in 2001. This year, Sarah shattered all 100-meter times when she posted 5.95 seconds. By comparison, Sarah’s 100-meter run was nearly four seconds faster than the world’s fastest man, Usain Bolt of Jamaica, whose fastest time for the same distance is 9.58 seconds. Sarah’s top speed was clocked at 61 mph.